What exactly is diamond color? While most people think of the classic, transparent diamond, which happens to be the most rare and valuable, the colors of diamonds actually range from transparent all the way to a brownish color. There are different saturations of diamond color and tones. The Gemological Institute of America, known as the GIA for short, is the most commonly used system for evaluating diamond color. They've created something known as the “GIA Color Grade Scale,” and it has placed a grading system on the many different colors and shades of diamonds, classifying into 22 letter grades. The Gemological Institute of America has certified diamond color grades as “master color comparison” diamonds. When a diamond is being graded it is compared against these master color comparison grades to find the shades that match it most closely. The diamond that is being graded must be thoroughly cleaned and all oil must be removed from the surface before being examined since even small amounts of dirt or oils on the surface of the diamond can alter the color. A line of master color comparison diamonds or shade chart is set up with each grade placed about one inch apart, ranging from the lightest and highest graded D shade to the darkest, graded Z diamonds. The diamond color that is being graded is moved from the left side of the comparison units to the right until it matches one of the shades. Diamond grading should take place in a colorless environment using a balanced fluorescent light source that has a filtered, cool white sun-like ray. The room where the grading takes place is dark except for the special grading light in order to obtain the most accurate grading of the diamond color. Yet another consideration when considering the diamond color is diamond fluorescence and how it will affect the actual appearance in the diamond color. Fluorescence causes some diamonds to change color when viewed in our everyday, ultraviolet lighting as well as under fluorescent light bulbs. When a diamond color is graded, the strength of the fluorescence of that diamond must also be indicated. It may be considered to be strong, moderate, or weak fluorescence and the reports must also indicate what color the diamond will change to due to the fluorescence. The reason for this is that when people are in the jewelry store looking at diamonds in the special lighting of the store, they may all appear to be the colorless, transparent diamonds. When you purchase a diamond and get it home under normal lighting, you could find your diamond is yellowish in color! You can ask your jeweler to provide grading documentation and information about the fluorescent value of a particular diamond before purchasing, to make sure that you will be happy with the diamond you buy. Many jewelers also can show you the diamond under different lighting conditions, which will enable you to fully appreciate the beauty of the diamond before you buy it. Some individuals prefer a diamond color with a darker shade while others are insistent on the transparent diamond color. 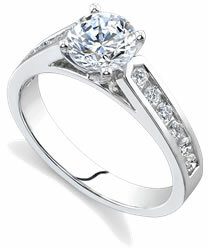 The diamond color is one of personal preference, so be sure to do a little research before making your final selection.